A genetic study focusing on the Central American river turtle (Dermatemys mawii) recently turned up surprising results for a team of Smithsonian scientists involved in the conservation of this critically endangered species. Small tissue samples collected from 238 wild turtles at 15 different locations across their range in Southern Mexico, Belize and Guatemala revealed a "surprising lack" of genetic structure, the scientists write in a recent paper in the journal Conservation Genetics. The turtles, which are entirely aquatic, represent populations from three different river basins that are geographically isolated by significant distance and high mountain chains. The best possible explanation, González-Porter and her colleagues say, is that for centuries humans have been bringing them together. The turtles have been used as food, in trade and in rituals for millennia, widely transported and customarily kept in holding ponds till they were needed. 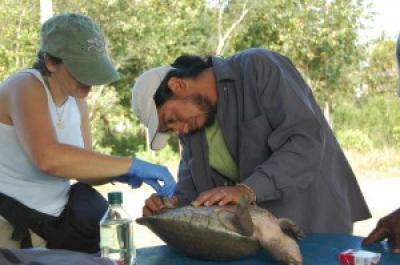 "The Central American River turtle is tame and resilient," González-Porter explains, "which makes it easy to transport. Their shells give them lots of protection. People don't have refrigeration so they put the turtles in ponds in their back yards." The genetic analysis of the Central American River turtle was initiated because these animals are critically endangered, González-Porter says. They are the last surviving species of the giant river turtles of the family Dermatemydidae. 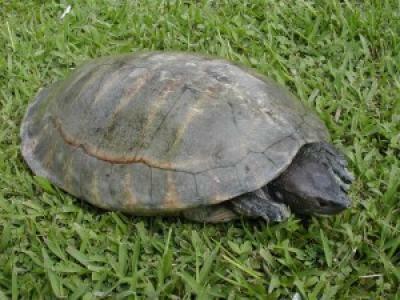 D. mawii is currently the most endangered turtle species in Central America. A recent increase in the commercial demand for its meat has pushed it to the brink of extinction—2.2 pounds of their meat can fetch $100. Most local populations have disappeared and this turtle is now largely restricted to remote areas that are inaccessible to humans.